The UK supreme court has made a final decision, denying tobacco firms permission to appeal against plain packaging. The decision means that all cigarettes sold in the UK after 20 May must come in the standardised packaging that’s been increasingly appearing in shops during the trial period over the last year. There will also no longer be packs of 10 cigarettes available in a move designed to deter young people from taking up smoking. For the same reason menthol cigarettes are being phased out but more gradually. They will disappear from shelves by May 2020. Last November, British American Tobacco, Imperial Brands, Japan Tobacco International (JTI) and Philip Morris International went to the supreme court after the court of appeal claiming that the plain pack law would infringe their human and intellectual property rights but he appeal was rejected. Any hopes the companies might have had that there was still a slim chance a challenge could be mounted will have been dashed by the final ruling. Cigarettes and tobacco: what are the new rules and regulations? The new rules have been made under new European Union law called the Tobacco Products Directive. Technically, the law came into force on 20 May last year, but companies were given a 12-month grace period to sell their old packs and bring in standardised packaging. From next month, all tobacco must be packaged in drab, dark brown packs with no graphic branding. 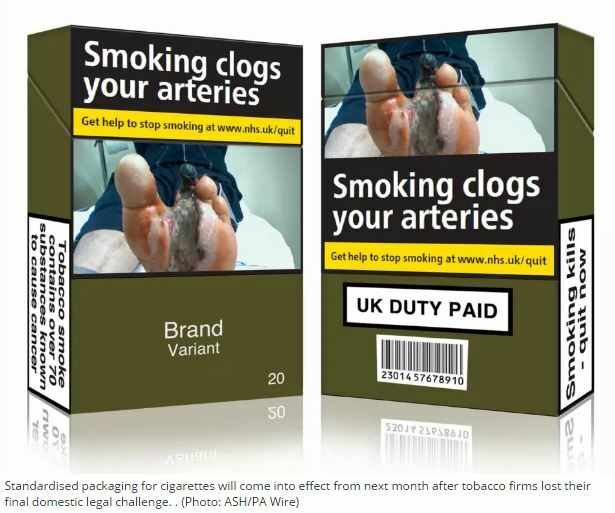 The new packs are the same shape, size and colour, with two thirds of the front and back surfaces covered by pictorial health warnings, and written warnings on the sides. From 21 May this year, anyone caught selling non-plain packs will face severe penalties. Smokers will also no longer be able to buy smaller packs of cigarettes and rolling tobacco while menthols will be phased out completely by May 2020. At the moment, rolling tobacco comes in 10g and 20g packets – but soon 30g will be the smallest size. The ban includes some flavoured tobacco and cigarettes – including fruit, spice, herbs, alcohol, candy and vanilla. There are also internal packaging requirements as well as rules for individual cigarette sticks. All other trademarks, logos, colour schemes and promotional images are prohibited. A pack of cigarettes is now at least £8.81, which campaigners say is a key factor in making people quit smoking. Action on Smoking and Health believe that removing the packet of ten cigarettes this means people will have to find that extra money for a packet. “It will hit poorer and younger smokers harder who are more likely to buy smaller packs,” a spokesperson said. Smokers’ rights group Forest said the new rules “treat adults like children and teenagers like idiots”. New vaping laws will also come into force next month restricting sale of e-liquids and e-cigarettes. Among the rules are: refillable tanks must have a capacity of no more than 2ml, e-liquids can not be sold in quantities greater than 10ml and e-liquid packaging must be child-resistant and tamper evident. New laws that standardise the appearance of tobacco packets and limit the range of products on offer come into force next month after a bid to halt the legislation was thrown out by the Supreme Court. What was the Supreme Court ruling about? Four tobacco giants took legal action in a last-ditch attempt to stop the introduction of mandatory plain packaging on cigarettes sold in the UK. They argued the law would infringe their human and intellectual property rights by making their products indistinguishable. In addition, they also questioned evidence that plain packaging would deter smokers. However, Judge Nicholas Green, who heard the original application for a judicial review of the 2015 legislation, ruled the regulations “were lawful when they were promulgated by parliament and they are lawful now in the light of the most up-to-date evidence”. What happens on 21 May? All cigarette packets will come in a single shade of “opaque couche” – a muddy green which The Sun describes as “the world’s ugliest colour”. Brand names will be written in a standard font, size and location on the pack, while health warnings will cover at least 65 per cent of the box or packet. They can also no longer carry words such as “lite”, “natural” or “organic” and menthol cigarettes will be phased out completely by 2020. Smokers will additionally not be able to buy smaller packs of cigarettes or rolling tobacco. Packets of ten are being axed, as are 10g (a third of an ounce) and 20g packs (0.7oz) of rolling tobacco. Amanda Sanford, spokeswoman for Action on Smoking and Health (Ash), told the Liverpool Echo that banning smaller packers was intended to deter younger smokers who are more likely to buy them because they are cheaper. Technically, the law came into force on 20 May 2016, but tobacco companies were given a 12-month period to standardise packaging and dispose of old stock. From 21 May this year, anyone breaking the new rules faces strict penalties. Health Secretary Jeremy Hunt said standardised packaging “will cut smoking rates and reduce suffering, disease and avoidable deaths”, while government chief medical officer Dame Sally Davies says she was “thrilled” the tobacco industry was not allowed to appeal. However, smokers rights group Forest said the new rules “treat adults like children and teenagers like idiots”. Is the UK the first country to do this? No. Australia led the way with a law that meant tobacco products on sale after 1 December 2012 had to carry plain packaging and French packaging legislation came into effect at the start of 2017. Similar laws in Ireland, Hungary and New Zealand have not yet been rolled out.